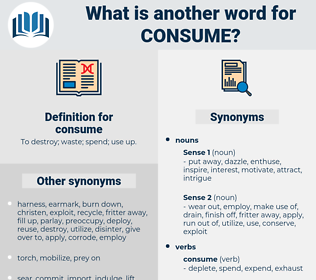 What is another word for consume? To destroy; waste; spend; use up. fuelling, are, spend, absorb, smoke, burn. 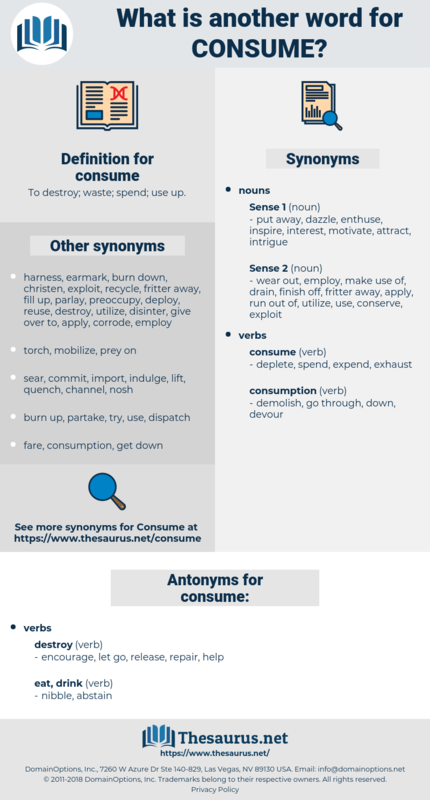 services, spend, consummate, absorb, drain, feed, ingest, occupy, Occupying, enjoy, expend. encourage, let go, release, repair, help. starve, create, store, collect, fill, gather, accumulate, not use, neglect, hoard, appear, fast. radiate, restore, renew, reinforce, increase, cast out, fortify, exude, send out, desist, enforce, construct, bolster, raise, enlarge, rebuild, revive, save, strengthen, give up, build, replace, erect, disgorge, emit, dissipate, augment, disperse, distract, preserve, put forth, vomit, eject, protect.
" And they consume time," broke she in, impatiently. But such of it as he did consume served as a stimulant for the purely imaginative part of his work, when the labor that required no stimulant was over and done. concussion, Ciconia Ciconia, concision, cancun, common iguana, Cuminum Cyminum, coenzyme, concession, consign, con game, communism, cancan, cayenne jasmine, connexion, cynicism, chimakum, cynoscion, Congo Gum, chance on, Cinchonine, cochin china, commission, coenzyme a, chewing gum, coonskin, chinookan, cosmogony, cyanogen, cinchona, consomme, cynancum, cannikin, Chaim Weizmann, Chinese Yam, chinchona, cosmogeny, Chinese Shan, Cajanus Cajan, Chinese Cinnamon, cunningham, chemakuan, canangium, chemakum, common jasmine, conjoin, coin machine, consignee, changan, cash machine, chymosin. finish, eat up, polish off.